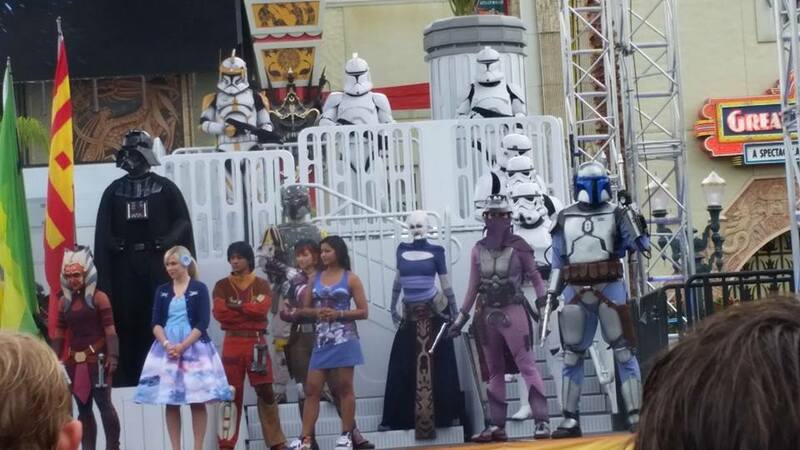 One of the biggest draws to Star Wars Weekends every year is the presence of Star Wars celebrities. Not only are they present, but most of the time, they sign autographs…for FREE! How awesome is that? Like in past years, Star Wars Weekends chooses a host for all 5 weekends. James Arnold Taylor takes on the role of the Star Wars Weekends host again in 2015. James Arnold Taylor voices many characters in the Star Wars Universe including Plo Koon and Obi-Wan Kenobi. James Arnold Taylor hosts the Star Wars: Rebels show at Star Wars Weekends 2015. Every weekend Star Wars Weekends has different celebrities. For Weekend #1 in 2015, the guests included: James Arnold Taylor, Ashley Eckstein, Tiya Sircar, Amy Allen and Ian McDiarmid. Unforuntely, because James Arnold Taylor is the host of all the shows and is in the celebrity motorcade, he is not signing any autographs this year. Between hosting 2 shows, Symphony in the Stars (fireworks show) and being in the parade, James Arnold Taylor has a lot on his plate….and apparently he needs to eat and sleep or something, too. Ashley Eckstein (unlike James Arnold Taylor) is not an official host, but she is just about as close to one as you can get without being one. Ashley (who is the voice of Ahsoka Tano in Star Wars: The Clone Wars and Star Wars: Rebels) will be at every weekend of Star Wars Weekends in 2015, but won't be an official guest until Weekend #4. Ashley is doing 1 signing everyday (at 12:45 P.M.) until Weekend #4 when she is a celebrity guest. She also holds a meet and greet at the Her Universe location inside Watto's Grotto every day from 3:30-4:30 P.M. in which fans can meet Ashley and have her sign Her Universe merchandise. Ashley is also in the celebrity motorcade as well as a host for a show on the main stage called "Padawan Mind-Challange: Family Edition". In this show, a family goes on the main stage and tests their knowledge of the Star Wars Universe against Imperial Officers and Stormtroopers. Tiya Sircar was also one of the celebrity guests for Weekend #1. Tiya is the voice of Sabine Wren in Star Wars: Rebels. Tiya is the guest in the show Star Wars: Rebels, which happens every day at 1:45 P.M. Tiya also participated in the celebrity motorcade and had 2 different signing times. The smile that is constantly on Tiya's face makes her one of the most inviting celebrities at Star Wars Weekends. This was only Tiya's second appearance as a guest, but she is becoming a pro. Tiya even celebrated her birthday on the Saturday of Weekend #1. Ashley Eckstein and Tiya Sircar portray two strong, female characters. In addition to these two females, Amy Allen attended Weekend #1 as well! Amy plays the role of Aayla Secura in Star Wars Episode II: Attack of the Clones and Star Wars Episode III: Revenge of the Sith. Although Amy's character does not have any speaking lines, her character remains one of the most popular female Jedi among Star Wars fans. Amy did 3 different signings each day of the weekend in addition to being in the celebrity motorcade and showing up as a guest in the Stars of the Saga show. The final celebrity guest is a Dark Lord of the Sith. The Emperor himself arrived at Star Wars Weekends for Weekend #1. Ian McDiarmid plays Emperor Palpatine/Darth Sidious in all of the Star Wars movies except for Star Wars Episode IV: A New Hope. Unfortunately, because Ian is such a big guest, he was not doing any signings over the weekend. Ian did however participate in the celebrity motorcade and the Stars of the Saga show. Ian has a great personality and was cracking jokes much of the weekend. All the celebrities were great over the first weekend. It really set the tone for the remainder of Star Wars Weekends 2015. All the celebrities gathered on the main stage after the celebrity motorcade for pictures and to get people excited for what the remainder of the day had in store!